When you crank down a dimmer, you are lowering the amount of power sent to a bulb. 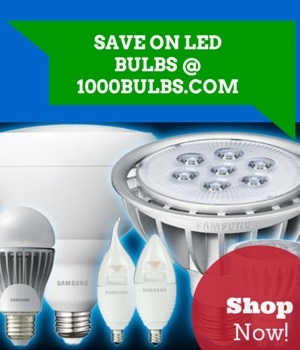 The more you dim the bulb, the less power you use, resulting in lower energy use. As discussed in a recent blog on how to extend the life of a light bulb, delivering less power to the bulb reduces the stress on an incandescent or halogen bulb filament. The less stress the filament is under, the longer it will last. This goes back to reasons 1 & 2. Using less power means saving electricity, potentially reducing pollution produced by power plants. Longer bulb life also means throwing fewer bulbs away, resulting in less landfill clutter. In addition to reducing pollution, some scientific studies suggest dimming lights in the evening has less negative effect on sleep cycles than burning bulbs at full power because dimming a bulb also lowers its color temperature, replicating the effect of the setting sun. Let's face it. Rooms with dimmed lights just look more inviting, even romantic. Next time you go to a nice restaurant, take a look at the lights. Nice aren't they? Now go to McDonald's. Not so nice, huh? The secret is dimming. You may be a pretty girl or a handsome guy, but that doesn't mean lighting can't still help. When you dim a bulb, you are changing the light from bright white to a warm, inviting tone, softening the appearance of your hair and skin. Contrary to what you may think, most dimmers are incredibly easy to install. Just turn off the power at your breaker, remove your standard toggle switch, and replace it with your new dimmer. The same 3 wires you disconnected from your toggle switch (positive, negative, and ground) attach to the dimmer in the same configuration. This may be the best reason of all. While sophisticated, multi-location electronic dimmers like the Lutron Maestro can cost upwards of $25, a standard rotary dimmer or slide dimmer will cost less than $10. For less than a $10 investment, what do you have to lose? Apr 6 How Do Infrared (IR) Halogens Save Energy? Apr 13 How Many Lumens Do I Need?